The Haiti Fundraiser or “charity lottery” as I’ve since learned these things are called, is going insanely well, much more than both Susan or I expected. Not too long ago, we passed the $400 mark. Can you believe that? You all are a very generous bunch of readers and we thank you from the bottom of our hearts! Today’s bento is the one that I had been planning before I found out about Mochi, so I was able to make it for today instead. I bought a new lens (Nikon 50mm f/1.8D AF Nikkor Lens ) for my camera with some Amazon credit I had hanging around and decided to try it out this morning. Warning: I have multiple photos of exactly the same shot because I’m not sure which looks best. I’m not quite used to this type of lens, so it’ll take a lot of adjusting, especially since I have no freaking clue how to use it, hahaha! 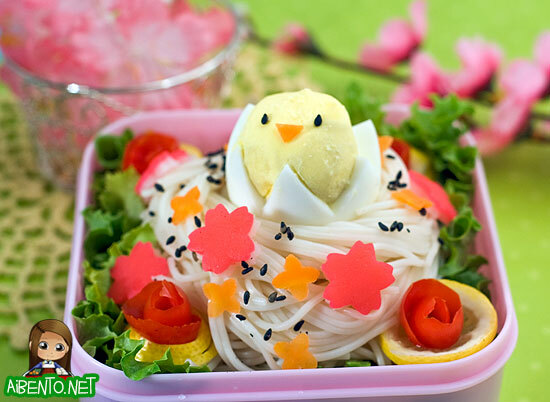 For those not sure what it is, it’s a somen salad made to look like a little bird’s nest in a flower garden. 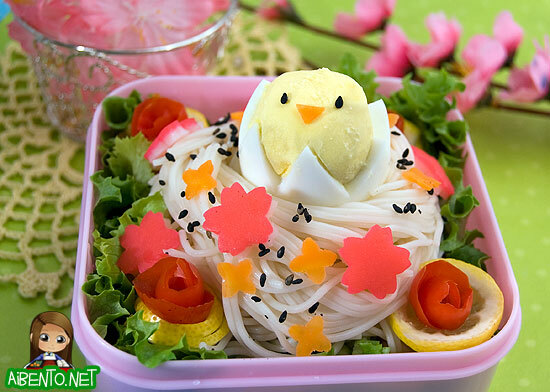 Usually the somen salad that my mother makes has somen, iceberg lettuce, shredded egg omelet, and kamaboko. I think she sometimes has cucumber too, but that part of my memory is fuzzy. Anyhoo, this is my own version with green leaf lettuce framing the outside, a somen nest in the middle, and kamaboko flowers. The first photo was taken with my new lens and what my amateur eyes tell me is that the focus is on the left area of the nest. This one seems to focus more on the bird and was also taken with the new lens. Somen should be cold, so I boiled the noodles last night and stored it in the fridge. This morning, I wet my fingers and began straightening some noodles and twirled them around to make the nest. I let that rest in a bowl and after I put in the lettuce, I added the remaining noodles into the bottom. Since I had a cucumber that is probably 2 days away from becoming goo, I julienned a big chunk and placed it on top of the spare noodles, then placed the nest on top of that. 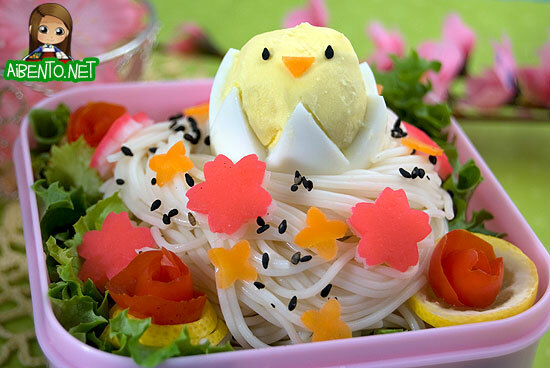 Obviously, you can’t have the bird on the nest remain intact if you cover the box, so if I’d wanted to include it all, I’d have either picked a bigger/deeper box or simply left out the spare noodles and cucumbers so that it wasn’t quite so high. I think I took this one with my old default lens that came with the camera. The entire front of the nest seems clearer to me. After adding the nest, I started tucking in thin slices of lemon that I curled to hold the tomato roses. 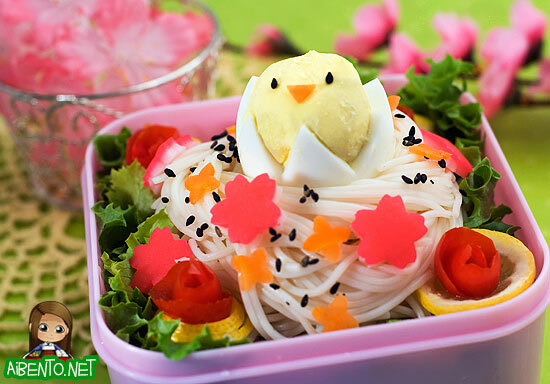 I got the idea for them from Kashmirkat when she posted her lunch on Bento Central. I’d never made them before and when she said that she made them from grape tomatoes, I thought that sounded a lot less intimidating than using a whole tomato, so I gave it a try and it was incredibly easy. The lemon slices made great holders for them! This last photo was definitely taken with my old lens, as I was able to zoom in for a closer shot and from a slightly different angle. I added the kamaboko sakura and ninja star-looking carrot flowers, then sprinkled some roasted sesame seeds to make the colors pop out more. Last of all came the chick. That suckin’ thing gave me so many problems. This was actually my THIRD boiled egg, as I didn’t boil the first two long enough to have the yolk not stick to the whites. I ate the mistakes for breakfast, then when I realized I’d put too much salad in, I had to eat the bird too. This would probably fit really nicely with a quail egg chick. I made some of my mom’s bitchin’ somen sauce to go with it. This version is scaled down 4x, so you can multiply it to make for a party. Please note though, a little goes a long way. Don’t just pour this stuff all over your salad. Lightly drizzle some on and mix it up. You’d be surprised how much a little sauce can cover when it comes to somen. I used maybe a tablespoon and that was more than enough. 1. Mix all ingredients in bottle and shake well. Don’t strain yourself here. If this is too difficult, don’t be afraid to ask for help. I believe this recipe is included in my upcoming book with Luckysundae, Yum-Yum Bento Box, so if you’d like this recipe and more, be sure to buy the book when it comes out later this year! I mentioned that I weighed in Monday at 148 and then somehow managed to lose two pounds in one day. This morning when I weighed myself I was 144.4, which brings me to 3 1/2 pounds lost in five days. This is actually unhealthy weight loss, but I’m guessing it might have been because I was actually carrying a ton of water around and that essentially cutting all sweets except fruits out has helped my body to flush all the junk foods out and circulate better, therefore burning more. Either way, woohoo!